Dubrovnik is situated in the very south of Croatia and can be reached by the sea from several ports in the Adriatic. The only international ferry connection with Dubrovnik is from the port of Bari, in the southern Italy. This route is operated by Jadrolinija's car&passenger ferry starting from spring until the end of autumn. Dubrovnik has no direct ferry connections with ports in Montenegro, Albania, Greece or Turkey. You can also reach the port of Dubrovnik from several Croatian ports on the coast as well as on the islands. During summer season Krilo company operates modern and fast catamarans between Split and Dubrovnik. Catamarans stop on the islands of Brac, Hvar, Korcula and Mljet as well as at Makarska. Throughout the year GV Line runs catamarans between the port of Dubrovnik and the island of Mljet. 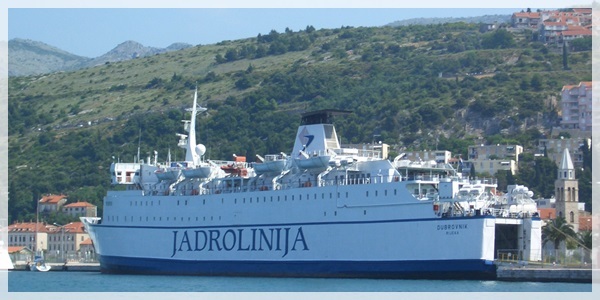 Croatian state company Jadrolinija connects port of Dubrovnik with Elaphite islands throughout the year. Small passenger boat sails daily between Gruz port and the islands of Kolocep, Lopud and Sipan. During the summer Jadrolinija operates catamaran route from Dubrovnik to Korcula, Hvar, Brac (Bol) and Split. This catamaran is ideal for those who wish to take a day trip to the Central Dalmatian islands.